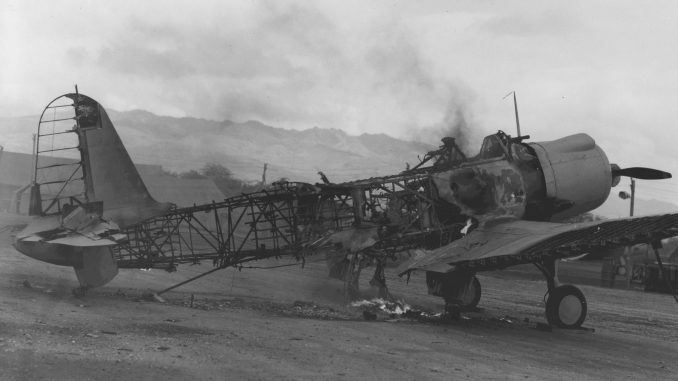 A Vought SB2U Vindicator dive-bomber, still smoldering, shortly after the Japanese attack on Ewa and Pearl Harbor. Public Event:– Many distinguished speakers – Pearl Harbor – Ewa Field Commemoration, aircraft flyovers, Marine Forces Pacific Band, Pacific Air Forces Honor Guard. Part of the officially recognized Pearl Harbor commemoration week. This will be held Saturday, December 9, between 9 AM to 10:30 AM at historic Ewa Field, located near 4365-4423 Roosevelt Ave, Kapolei, HI. Please arrive by 8:30 AM. We would like to extend an invitation to the public and especially veterans and members of the Armed Forces to the 10th annual Ewa Field Battlefield Commemoration at the former Navy and Marine Corps airbase known as Ewa Field. This commemoration is in honor of those killed on December 7, 1941 at Ewa Field, Ewa Plantation Villages and the Ewa Battlefield area of West Oahu. 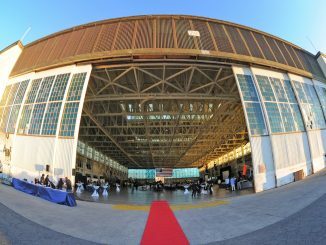 Ewa airfield’s naval history goes back to 1925 as a planned “lighter than air” airship mooring field with a later added coral runway used by Navy and Army Air Corps planes in the 1930’s. 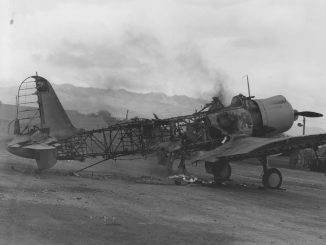 Just as final conversion to a US Marine Corps advanced expeditionary airfield was taking place in December 1941 as Marine Air Group 21, Ewa Mooring Mast Field, Japanese main attack force naval fighters and bombers swept through the Ewa Plain and Ewa shoreline on December 7, 1941 to attack the airfield prior to the bombing Pearl Harbor. Recent museum and archive research now documents Ewa Field, then known in early 1942 as Naval Air Station Ewa and Naval Air Station Barbers Point, as providing the main aviation force of Navy and Marine planes, pilots and squadrons that heroically fought in the June, 1942 Battle of Midway. Many of the Ewa Field planes and pilots were lost in valiant air attacks on the large Japanese fleet. This climatic and decisive battle brought nearly full revenge for the Pearl Harbor attack as four Japanese aircraft carriers of the 1941 raid were sunk in just five minutes. Today Midway is considered the most important naval battle in American history. In 2018 a major movie will be filmed on Oahu about the 1942 Battle of Midway. On June 4, 2017 at Ewa Field we also commemorated the 75th Anniversary of the Midway battle and those lost from Ewa Field. Ewa Field symbolizes the phoenix rising from the 1941 ashes to in 1942 leading the United States to victory in the Pacific War. Many local and national veterans and community organizations are requesting this very important 1941 attack site and 1942 Battle of Midway historic airfield be added to the WW-II Valor in the Pacific National Monument and made a National Historic Landmark. The current Ewa Battlefield commemoration site property is being conveyed by the US Navy as surplus land through the Department of Interior handling the conveyance to the City as a future park. Daniel Martinez – WW-II Valor in the Pacific National Monument historian. Topic: NPS historic overview of Ewa airfield history. Topic: Ewa Plantation Dec 7, 1941, WW-II history cultural landscape. Valerie Van der Veer – President, manager, Barbers Point Riding Club. Col. Jason Seal – (USMC Ret.) Senior Marine Instructor, Kapolei High School MC JROTC, designated Naval Honor School program for three consecutive years. Topic: Remembering the Marines at Ewa Field. Regi Perry – (Major, USA Ret.) General Manager Barbers Point Aviation Services. 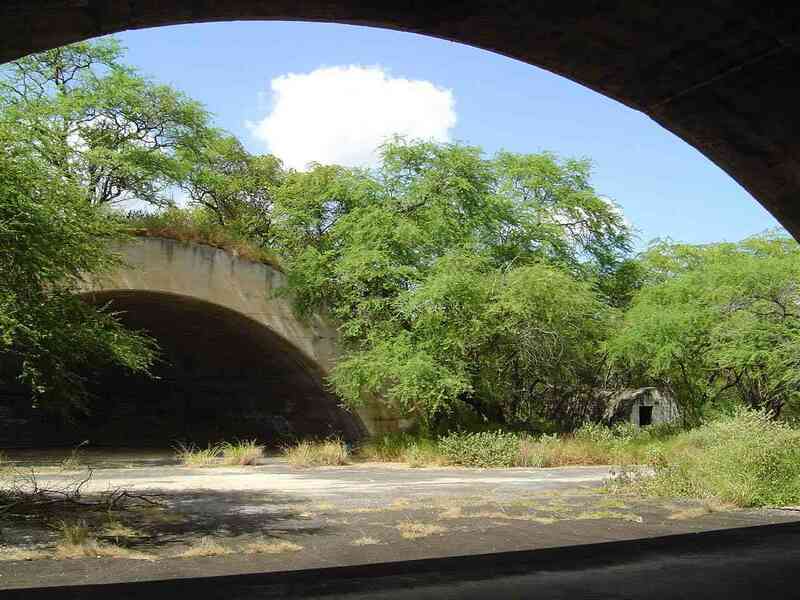 Topic: Remembrances of growing up in Ewa Villages, Barbers Point community. Successful Ewa veteran entrepreneur. Ross Stephenson, PhD – noted historian, Previous Keeper of Hawaii Register. Topic: Why historic Ewa preservation is important for community cultural identity.